CPS Energy recently honored former CEOs Jamie Rochelle and Milton Lee by dedicating and renaming critical projects that each spearheaded. The Jamie A. Rochelle Energy Management &Training Center recognizes Rochelle’s commitment to preparedness, technological innovation, and continuing education. The Milton B. Lee Peaking Units at Leon Creek and Braunig Lake acknowledge Lee’s strategic leadership and integration of technology to meet the community’s growing electricity demand and minimize emissions. The event highlighted two firsts for the company — Rochelle as CPS Energy’s first female CEO, and Lee as the first African American to head up the nation’s largest municipally owned electric and gas utility. 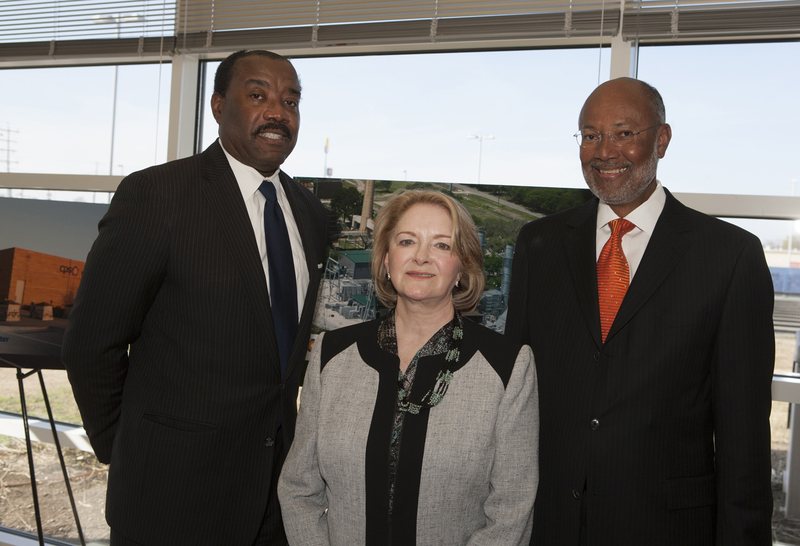 Current CEO Doyle Beneby poses with former CPS Energy CEOs Jamie Rochelle, center, and Milton Lee. Rochelle started her career as a computer programmer in 1969. Over the next 29 years, she rose to the executive ranks and was named general manager and CEO in 1999. She remained at the helm through 2002, navigating the company through the early stages of Texas electric utility deregulation and the addition of our very first renewable generation source. “Jaime was passionate about employee development and training, so this honor seems appropriate for our great leader,” said current CEO Doyle Beneby. Lee joined the company in 2000 as senior vice president of electric transmission and distribution, then followed Rochelle as general manager and CEO in 2002. He led the company through massive changes as public utility deregulation was anticipated, implementing widespread technological, process, management, and generation planning changes to move the company to competitive readiness until his departure in 2010. The dedication continues CPS Energy’s history of honoring former leaders’ contributions to the ongoing, sustainable success of the company. The event was attended by local dignitaries; family, friends and professional peers of Rochelle and Lee, and CPS Energy executives and retirees. Lee shared a similar sentiment. Rochelle and Lee were each presented with a commemorative compass symbolizing their commitment to moving our company in the right direction.